How often do you have a conversation about how to make your work more meaningful with your colleagues or even just yourself? 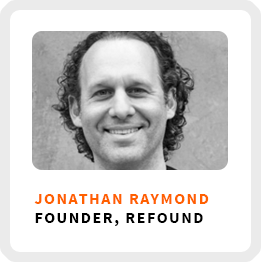 Jonathan Raymond is on a mission to help us all redefine work by encouraging all of us to have more meaningful conversations about the purpose of our work. And to do that he says we all need to be more Yoda and less Superman. He’ll explain! He’s the CEO of Refound, a leadership consultancy he founded a couple of years ago after leaving as the Chief Brand Officer of the EMyth of Michael Gerber fame. Last year he published, Good Authority: How to Become the Leader Your Team Is Waiting For, a book rethinking how we manage and motivate people. Why taking the time to stop and reflect is the most important action for reassessing your work. Why managers need to speak their minds instead of playing nice, which can end up being cruel. How micro mentoring helps people stick to new habits. Core work activities + habits: 1) Being patient, waiting for people to come to him rather than chasing down sales. 2) Removing himself from any activity that he can in order to create space for others. 3) Being methodical, trying to stick to one thing at a time. Definition of success: Making a positive impact on human beings. Sharing what he’s learned and also learning from others. 90-day goal: Have the majority of Refound workshops delivered by other people. 1) Examine dynamics between yourself and others. In a meeting or a phone call, take a step back and think about what dynamic is at play. 2) Write it down. Build an inventory of those dynamics to start exercising that mindfulness muscle.